White Noise is one of those albums that I can listen to at any time and still love it just as much as the first time I heard it. It never gets old. When PVRIS announced their new album, I was excited, but wondered how it was possible that I could love this album as much as White Noise. And then I heard AWKOHAWNOH and realized I was an idiot for even having doubts. This is, hands down, the best album so far this year. 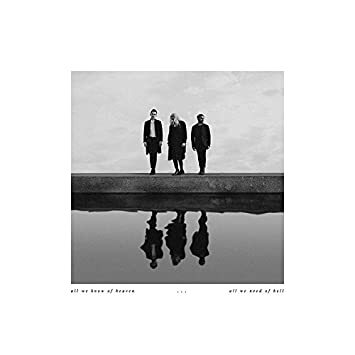 It balances pop with this dark and eerie sound that only PVRIS seem to know how to accomplish. The whole album just feels epic. Lynn’s voice embodies the heaven versus hell balance of the album—her soft and sweet vocals giving way to gravelly screams. This album finds them incorporating and experimenting with some new sounds musically. Some songs feel like they lean more towards pop and then will twist into a PVRIS that’s heavier and darker than before. “No Mercy” is a great example of this. The lyrical content seems to stray from the hypothetical monsters that were the main focus on the last album. Everything here feels a bit more real. And it makes sense. The band members have grown older, gone through more. Songs like “Anyone Else” really make you feel like the band are baring a part of their soul. “What’s Wrong” and “Nola 1” hit hard, dealing with things like anxiety and depression. Lynn posted a long note on her Instagram about the album that ended with, “All that matters is that you are feeling.” And you definitely feel with this album. It’s a rollercoaster of emotions, but that’s what life is, right? And what a beautiful rollercoaster PVRIS has made it out to be. They make even the hardest moments sound like magic. I could probably go on endlessly finding new things to say about AWKOHAWNOH. But I’ll end it with this: If you’re going to buy one album this year, make it this one. All We Know of Heaven, All We Need of Hell is available now.